*EDITOR’S NOTE: This article was corrected on January 14 at 11:30 a.m. Deacon Silva has served as permanent deacon for the past four years, not three. Believe what you read. Teach what you believe. Practice what you teach. It was one of the most profound moments of my life. The Bishop laid his hands on my head during the rite of ordination and everything changed. There were no fireworks, no tongues of fire, the heavens were not rent open and no voice was heard (as far as I know). My personal experience was one of a sense of peace and a sense that this was right and necessary for me to be whole. After four years of formation provided by the Diocese of Arlington and the Notre Dame Graduate School of Christendom College, as well as a fairly intensive discernment program, the Church, through Bishop Loverde, called 16 of us personally and ecclesially to serve in the manner of Jesus as ordained ministers. That morning, we pledged ourselves to the Bishop and his successors to a life of ministry through the Word, Altar and Charity. The most memorable part of the ritual that continues to ring in my ears is when the Bishop presented me with the Book of the Gospel, looked intently at me and challenged me, “Believe what you read. Teach what you believe. Practice what you teach.” These words comfort me and haunt me to this day. They are a reminder that the proclamation of the Gospel is best heard through a life imbued, transformed and lived in the joy and intimacy of an intentional and personal relationship with Jesus the servant. Something I am still working on. Over the past four years, my diaconal service and assignment at St. Mary of Sorrows in Fairfax has been a source of much learning and great joy. The parishioners have not only been patient and supportive, but have assisted me in my homiletics, challenged me to grow more in prayer, and inspired me to serve in ways I had never considered. My family life has been transformed, as well, and is instrumental in my service. There is the obvious scheduling and management of time that is oh-so-important. But most importantly, the support, encouragement, and assistance (when possible) of my wife and children has strengthened me in ways that push me to faithful ministry and to become the man that God designed me to be. It has literally drawn us together and out of ourselves. I am confident that my diaconal vocation arose from within my marriage and family life. I would not be ordained if not for the love and support of my family. The occasional (maybe more than occasional) kick in the pants from them is essential for my ministry, as well. 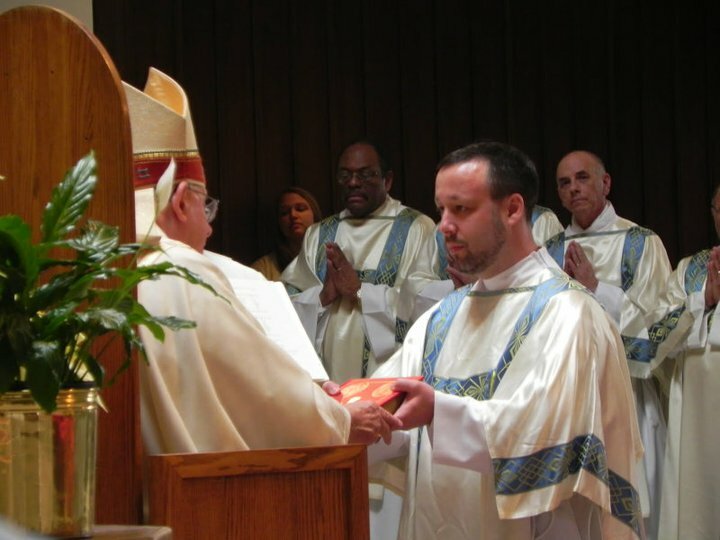 This Thursday is the third anniversary of my ordination. While I am out with my family celebrating with them, 11 other men will be with Bishop Loverde as they enter the final preparations for their ordination this Saturday at the Cathedral of St. Thomas More. I want to encourage everyone to take some time and specifically pray for these courageous men by name. They are about to embark on an adventure of loving service wherever the Bishop and the Church has need of them. To my future brother deacons, I want to say: “Congratulations and blessings upon your many days of diaconal service.” And to the diaconal class of 2011, Happy Anniversary, brothers! Arlington Bishop Paul S. Loverde will ordain 11 men to the permanent diaconate Jan. 17 at the Cathedral of St. Thomas More in Arlington. The liturgy begins at 11 a.m. and is open to the public. Visit the Arlington Catholic Herald article here for the stories and photos of these 11 men who will be ordained. This entry was posted in Deacon Marques Silva and tagged 3, alter, anniversary, Arlington, Believe what you read, Bishop, book, called to serve, challenge, charity, christendom college, Church, comfort, command, deacon, diaconal, Diaconate, diocese, ecclesial, ecclesiastic, Fairfax, family, Gospel, haunt, homiletics, Jesus, joy, life, minister, ministry, Notre Dame, obey, ordain, parish, peace, Practice what you teach, present, program, relationship, rite, ritual, servant, serve, service, St. Mary of Sorrows, support, Teach what you believe, three, transform, vocation, Word. Bookmark the permalink. I love the idea of praying for the soon-to-be-ordained by name. And Happy Anniversary, Deacon Marques! I’m so glad you are at St. Mary’s.